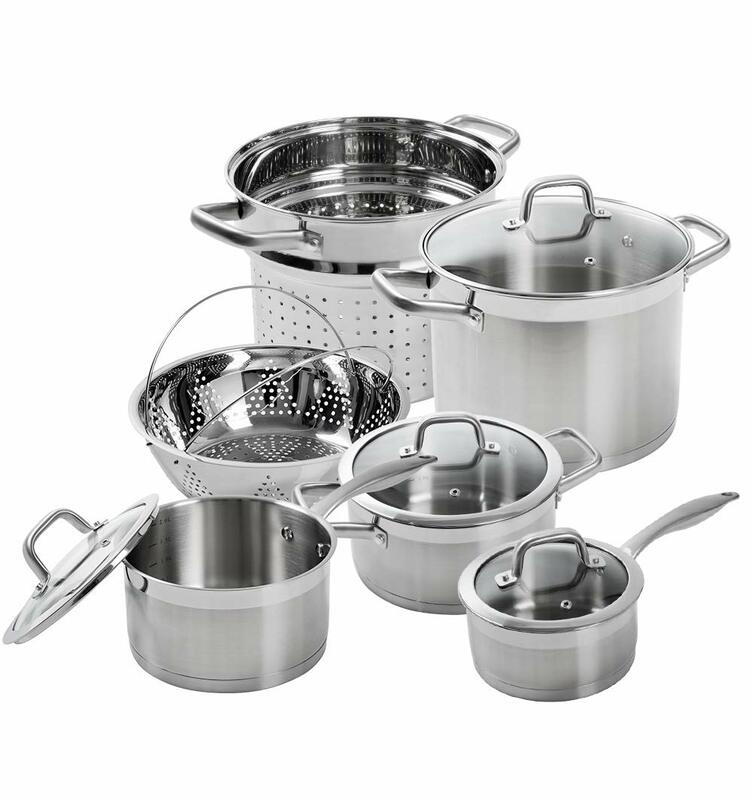 Includes 1.6-quart, 2.5-quart sauce pans with lids; 4.2-quartwith lid; 8.6-quart stock pot with lid; 9.5″ boiler basket and steamer basket. Constructed with 18/10 commercial grade stainless steel, heavy gauge impact-bonded aluminum encapsulated bottom, built to last a lifetime. Ergonomically shaped handle with anti-slippery satin finish, handle is riveted to pans to provide durability. Suitable for all cooking sources, electric, gas, infrared, induction stove or radiant glass and ceramic cooktop. Dishwasher-safe; Freezer-safe for food storage; Lifetime limited warranty. This versatile set functions beautifully with gas, electric, halogen, ceramic and induction stovetops, and each piece is oven-safe up to 550°degrees. Versatility extends to cooking options as well. Whip up anything from marinara sauce to bechamel with 1.6 and 2.5-quart saucepans; use the steamer basket insert to savor healthy fresh vegetables without added fat; simmer a hearty stew in the 8.6-quart stock pot or bake a simple week night dish in 4.2-quart casserole. Unconditional Hassle Free Return during the first 30 days of purchase. Our exclusive impact-bonded technology creates a cooking surface that is 5mm thick, which insures fast, even heating along the bottom and side walls of the cookware. The snug fit of the stylish glass lids keeps the heat and moisture in, while perfect-grip handles stay cool. The ergonomically shaped handles are dual-riveted for stability and feature a matte finish to provide firm gripping, even when hands are wet or greasy.